The 2014 Work Truck Show is an event held by the Association for the Work Truck Industry. It is the largest work truck event in North America, with a total of 500000 square feet of trucks and equipment. Here is an outline of the show in general and the main attractions of the show. The Work Truck Show tries to emphasize innovative products, industry education and green technology in one fascinating event. Generally, the content of this years show can be outlined by some of the highlights. First, United Parcel Service (UPS) announced their planned collaboration with the Property and Environment Research Center (PERC). Next, the show included an astounding array of seminars on the work truck perspective of improving your business. One helpful seminar, for example, explained several aspects and tips regarding the North American Free Trade Agreement (NAFTA). On the second day, green vehicles were demonstrated at the Ride-and-Drive, which is a great way to show people the power of environmentally friendly cars. Displays and exhibitions were excellently combined for a smooth event experience. In the midst of the primary hall one was surrounded by the conversation of knowledgeable hobbyists to self proclaimed connoisseurs. This year, the opening reception was moved towards the end of the day. All the better for curious and energetic enthusiasts to get to business! Starting the show with seminars on marketing related to work trucks was a great way to set the pace for the next few days. One of the most prominent new products came from Cirrus Controls. They won the Innovation award for their GPS DataSmart Winter Maintenance Reporting System. Their award was earned for cutting edge technology in maximizing driver security during harsh weather conditions. For example, it registers the position, ground speed, air and road surface temperatures to be evaluate by advanced algorithms to increase driver safety. This is undoubtedly the next step in vehicular travel. 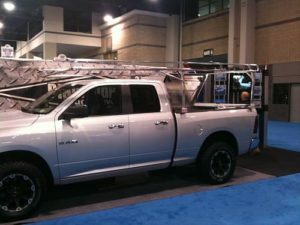 All in all, the 2014 Work Truck Show gave a great indication of the technology to come this year. Even beyond all the mind blowing technology, it was also a great even to meet potential business partners in your field. ← A Smaller, more Compact Chevy Pickup Truck?